Is Planned Parenthood purposely marketing abortion to minorities? According to author Willis Krumholz at The Federalist, Planned Parenthood’s business model promotes that strategy because it’s in their financial best interest to do so. Furthermore, he proposes that data showing the harm done to poor and minority women has been whitewashed by the formerly reliable Guttmacher Institute in order to protect the abortion giant. Proof of Planned Parenthood’s purposeful presence in minority areas was established by Protecting Black Life, an outreach project of Life Issues Institute, in a 2012 study finding that 79% of Planned Parenthood’s surgical abortion facilities were located within walking distance of a Black or Hispanic neighborhood.1 Using 2010 Census data, this study documented the racial demographics of each census tract (similar to a neighborhood) within a 2-mile radius of each of Planned Parenthood’s 163 surgical abortion facilities operating in 2010. A census tract was counted as a minority neighborhood if its minority racial percentage reached over 50% or if it was 1.5 times that of the county percentage. Census tracts with racial percentages below the national average population of 12.6% for Blacks and 16.3% for Hispanics were excluded. An updated analysis in 2015 found that the new set of 173 Planned Parenthood surgical abortion facilities operating in 2014 continue their practice of heavily targeting minority neighborhoods for abortion, with 78% within walking distance of these communities. In response to our 2012 research, the Guttmacher Institute blasted out an advisory claiming that only 9% of abortion facilities were located in majority Black neighborhoods.2 Their study relied on zip code mailing areas, ignoring nearby minority neighborhoods in different zip codes, and revealing little about the actual demographics surrounding the abortion facilities. In addition, by only including Black populations of 50% or more, nearly 4 times the national average, it excluded the many neighborhoods where minorities have a strong presence without holding a majority. For perspective, 28 states have Black percentages under 12.6% and the highest Black population of any state is 30.5%. In reality, this study was a smokescreen intended to allow media and pro-abortion activists to preserve the storyline that Planned Parenthood Federation of America (PPFA) is not targeting minorities. To accomplish this deceptive conclusion, Guttmacher’s study included all abortion facilities providing over 400 abortions per year and offered no supporting data to unravel the truth about PPFA’s locations. But facts are stubborn things, and Protecting Black Life’s research presents both facts and data. So how is targeting minorities for abortion a financial win for PPFA? With abortion rates dropping in the early 1990’s, PPFA’s business relied heavily on providing low-margin contraceptives to poor women. Logically, the abortion giant’s revenue flattened and net margins began to decline. It was time for a new strategy. By 1997, PPFA had executed a new business plan to increase revenue by focusing on high-margin abortion, moving to larger facilities that took advantage of economies of scale, and locating in dense urban areas where high concentrations of poor and abortion-vulnerable clients, particularly minorities, would be assured. Everything about this plan points to a strong financial incentive to market abortion to minority women. As a result, PPFA’s revenue has increased dramatically from $400 million in 1990 to 1.3 billion in 2013. By performing 2.5 times as many abortions in 2011 (333,964) as they did in 1990 (129,155), their 8% market share skyrocketed to 33% at a time when total abortions declined from 1.6 to 1.1 million. Clearly, PPFA’s new strategy has worked well for them financially. But what has happened to the poor and minority women that they claim to want to help? The picture for these women is much less rosy. By leveraging substantial influence in securing Title X funding, PPFA has become the primary option for minority women who need low-cost contraceptives. While abortion offers a high profit margin, contraceptives do not. Therefore, PPFA affiliates have little incentive to provide high quality contraceptive care and instruction to clients. And yet, with PPFA’s ubiquitous neighborhood presence, many minority women develop a dependence upon their contraceptives and become ensnared in the active sexual lifestyle they promote. As PPFA knows, contraceptive failure (54% of women who receive abortions used contraceptives4) ensures a high likelihood that the client will return with an unintended pregnancy. 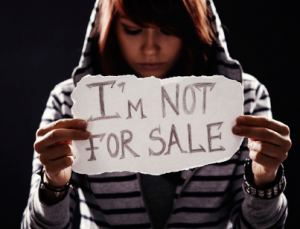 This provides an opportunity for the much more profitable scenario of selling an abortion. Such a strong financial incentive can only increase the risk of abortion for vulnerable women. 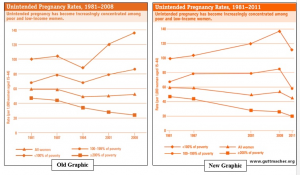 In his article, “Guttmacher Erases Data To Protect Planned Parenthood, IUDs,” Krumholz5 points out that unintended pregnancy rates among poor women had dropped considerably in 1994 (Figure 1), before PPFA’s “reinvention.” The drop in 1994 was followed by a sharp rise in 2001, coinciding with PPFA’s changed approach, and a continued rise through 2008. Clearly, as PPFA’s market share and revenue rose, unintended pregnancies for poor women increased significantly. Krumholz then shows a similar graph, released by Guttmacher in March 20166 (Figure 2) where the 1994 data point has been removed, implying that unintended pregnancy rates took a smooth ride up from 1981 to 2008 and that Planned Parenthood’s business plan had little effect on low-income women’s unintended pregnancy rates during that period. Meanwhile, the Guttmacher report expounds on the crucial need for publicly funded contraceptives for preventing unintended pregnancies. This may be Guttmacher’s attempt to protect the narrative that Planned Parenthood (and thus its taxpayer funding) are helping poor women, when the actual data implies the opposite. Although many factors may have contributed to this bad news for minority women, it coincides suspiciously with Planned Parenthood’s intentional abortion facility presence in minority neighborhoods and with its aggressive push to market abortions for the purpose of lining its own pockets. And it appears that Guttmacher doesn’t want us to know it. Compiled from CDC’s U.S. Abortion Surveillance Reports, 1990 through 2011. This entry was posted in Planned Parenthood by Susan W. Enouen. Bookmark the permalink.